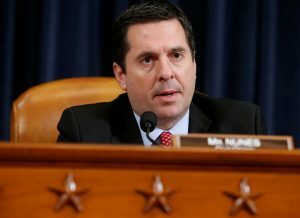 WASHINGTON — House intelligence chairman Devin Nunes met on the White House grounds with the source of the claim that communications involving President Donald Trump’s associates were caught up in “incidental” surveillance, the congressman’s spokesman said Monday. The meeting occurred before Nunes disclosed at a news conference that U.S. spy agencies may have inadvertently captured Trump and his associates in routine targeting of foreigners’ communications. “Chairman Nunes met with his source at the White House grounds in order to have proximity to a secure location where he could view the information provided by the source,” Nunes spokesman Jack Langer said. Previously, Nunes, R-Calif., would not say where he met his secret source. He has still not revealed who that source is. Nunes’ connection to the White House has raised concerns that his committee’s investigation is not a bipartisan, independent probe. He was a member of Trump’s transition team, as well. The Senate intelligence committee is also conducting an investigation into Russia’s interference in the election and possible ties with the Trump campaign. On Monday, the White House confirmed that Trump’s son-in-law, Jared Kushner, has volunteered to be interviewed by the Senate committee about arranging meetings with the Russian ambassador and other officials. Kushner is the fourth Trump associate to offer to be interviewed by the congressional committees looking into the murky Russia ties. Trump’s former campaign chairman, Paul Manafort, Trump adviser Carter Page and Trump associate Roger Stone last week volunteered to speak as well. Manafort, Page and Stone’s announcements last week that they would be interviewed came amid Nunes’ disclosures about the new intelligence he had seen. The White House was asked repeatedly last week about whether it was the source of Nunes’ information. The bizarre disclosure about the intelligence reports brought criticism from Democrats, especially those who sit on his committee and are working with him on an investigation into Russia’s interference in the 2016 election. That investigation is also looking into possible ties between Trump associates and the Kremlin. Nunes said the intelligence reports were not related to Russia. Nunes’ office did not immediately say what time the chairman met his source on White House grounds. Left: Chairman of the House Intelligence Committee Devin Nunes (R-Calif) questions FBI Director James Comey and National Security Agency Director Mike Rogers during a hearing into alleged Russian meddling in the 2016 U.S. election. House intelligence chairman Devin Nunes met on the White House grounds with the source of the claim that communications involving President Donald Trump's associates were caught up in "incidental" surveillance, the congressman's spokesman said Monday. Photo by REUTERS/Joshua Roberts.